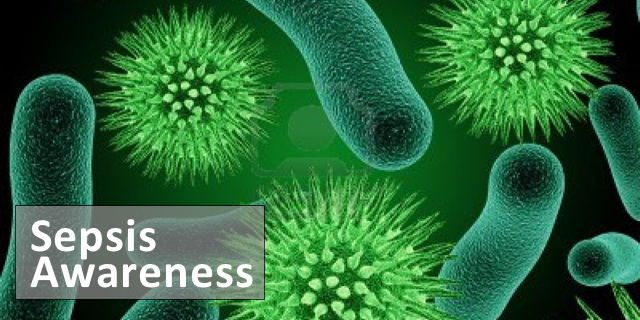 Home » Blog » What is Sepsis? Sepsis has been recognized for thousands of years. Hippocrates named sepsis. Unfortunately, most people still don’t know what sepsis is. The common name, “blood poisoning,” adds confusion. Anything from appendicitis to a scraped knee can lead to sepsis. This is because any infectious organism can start a systemic inflammatory response syndrome (SIRS). Toxins produced by the foreign organism cause white blood cells to release cytokines which cause blood vessels to dilate, releasing fluids which causes swelling. Normally, this reaction is limited. With sepsis, the response is systemic. Blood pressure decreases. Blood clots in organs, impairing blood flow to organs. The effect cascades to damage tissue until organs fail. Death follows. Severe sepsis occurs when an organ begins to fail. If you have one of these symptoms (along with two from above) you could have severe sepsis. Septic shock occurs with the above symptoms and low blood pressure. Treatment is antibiotics, surgery excising the infected area and IV fluids. Even so, the risk of death from sepsis is 15%; upon reaching septic shock, the risk of death is 40% or more. An estimated 31 million cases of sepsis, 24 million cases of severe sepsis and around 6 million deaths occur each year worldwide. Sepsis strikes 10% of US hospital patients. This anagram will help you recognize sepsis. “Shivering, fever or very cold” “Extreme pain or general discomfort (worse ever)” “Pale or discolored skin” “Sleepy, difficult to rouse, confused” “I feel like I might die” “Short of breath” For any combination of these symptoms, call 911 or get to the hospital. Say, “I AM CONCERNED ABOUT SEPSIS.” It could save a life. Thank you so much for this essential article. My mother was developing sepsis after surgery with many complications last year and NO ONE believed the family, despite the fact that my sister is a doctor and was telling the staff. Thankfully, she recovered, but spent months in the hospital. Why do medical staff downplay these symptoms? ?